With InLoox 9 you can sort project-independent documents into folders – directly in InLoox. 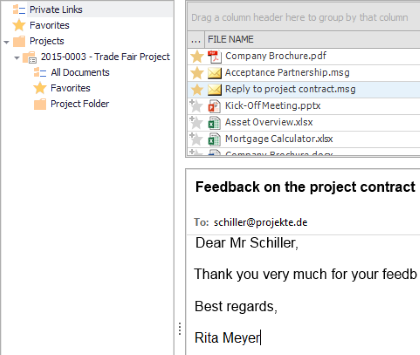 You can also add personal documents and manage them together with your project and department documents all in one place. You don’t even need to open a specific project. Organize personal and project-independent documents | InLoox 9 for Outlook • Copyright 1999-2019 © InLoox, Inc. All rights reserved.